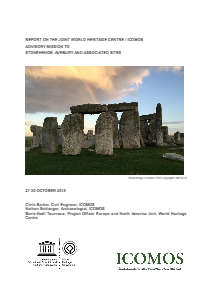 The Stonehenge Alliance has welcomed the findings of UNESCO’s mission to Stonehenge which are contained in its recently published its report. while the “preliminary idea” of an A303 tunnel of at least 2.9km would bring benefits to the World Heritage Site (WHS), “the siting and design of the tunnel portals, approach cuttings/embankments, entry/exit ramps and the temporary construction works have the potential to impact adversely”. They express particular concern over the Avenue, a major archaeological feature of the Stonehenge landscape, pointing out that any damage from further road construction here is “effectively irreversible”. UNESCO’s report demands “rigorous investigation, evaluation, iterative design and assessment to see whether and how it might be possible” [our italics] to construct a tunnel of the length proposed while protecting the essential qualities of the Stonehenge landscape. It questions the siting of the eastern portals, giving a strong steer that a longer tunnel (than 2.9km) would be of benefit. It also says that on the western side, the 1km approach road has the potential to impact on the integrity of the landscape. UNESCO say they expect the Government to implement its commitments under the World Heritage Convention. But “to do this requires longer term thinking than typical infrastructure design in non-World Heritage Sites. The whole asset life design of the scheme within the World Heritage Site should not be limited by 25 year traffic predictions…”. UNESCO recommend a radical approach before any options are brought forward. They warn that the normal Development Consent Order process and its timescale may be inappropriate for the Stonehenge WHS. The Stonehenge Alliance shares the concerns expressed by UNESCO and welcomes their steer towards a longer tunnel than currently proposed. UNESCO’s proposals must be fully adopted and World Heritage made paramount. Only if this happens is there a chance that this wonderful site might be safeguarded in its entirety from the impact of any major new road scheme.